Pet friendly Hotels in Aspen – Oh My! Pet friendly hotels in Aspen are some of the coolest in the U.S.
All around, Aspen is a good-old-mountain town that welcomes its four-legged friends with open paws. Check out our Aspen City Travel Guide and find everything pet friendly about it. For starters, you’ll find the city has a wide selection of top-notch pet friendly hotels. Pets are greeted with their names posted on the lobby board for a warm welcome at the Sky Hotel. This hotel accepts any number of pets without size or weight restrictions. In addition, your furry friends can stay free of charge. Pet owners are provided with pooper scooper bags and a walking map. Pets are provided with cozy pet beds, food bowls, pet walking and pet sitting. There’s also an exercise area for pets just outside the hotel. The Little Nell is a luxury hotel at the base of Aspen Mountain that pampers its furry guests with haute cuisine of beef tenderloin and breast of chicken. Pets can even dine with their owners at Little Nell’s Living Room and Terrace Bar. The St. Regis Aspen Resort is pet friendly and provides tasty treats, food and water bowls along with soft pet beds with Frette linens. 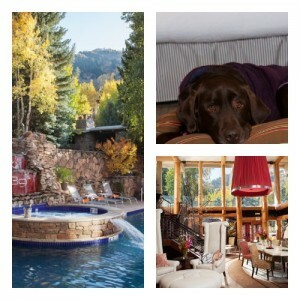 This hotel is also at the base of Aspen Mountain and close to nearby walking trails for pets. In Aspen, there are plenty of pet friendly restaurants for enjoying a bite to eat with loyal companion. The Zele Café is a popular spot in downtown Aspen that serves up light fare and offers pet friendly seating. Montagna is a fine wine and dining restaurant that even offers a pet menu for canines and felines. Pets can enjoy a classy dish along with their pet owners on the outdoor patio. There’s a wide choice of outdoor fun to enjoy side-by-side with your pets in Aspen. In White River National Forest, you can hike around Maroon Lake, Crater Lake and Buckskin Pass Trail with your pets. The Maroon Bells are a definite must-see. Shuttle busses leave from Aspen on an hourly basis, and pets ride for free. Pets can also hop aboard the Silver Queen Gondola to the top of Aspen Mountain and out Richmond Ridge. Once on top, there are trails for hiking with leashed pets. Aspen is an absolute pet friendly paradise. During high seasons, you definitely will want to book your hotel early. Start your search for pet friendly hotels in Aspen here and find the best for the least. Then just think about all the fun things to do. Have a great trip!